Sony SmartWatch 2 or Samsung Galaxy Gear? Home /Wearable/Sony SmartWatch 2 or Samsung Galaxy Gear? OK, so you have read both my reviews on the Sony and Samsung smartwatches. Which one do I prefer and why? The Sony SmartWatch 2 display is always on, sans backlight. You will be able to see the clock face and read the time. In contrast, the Samsung Gear needs to either press the button or to raise your hand high enough for the gyroscope to recognise that you are trying to read the time and then turns on the screen automatically. SmartWatch 2 is also lighter and uses a standard watch strap so you can change to any strap. The battery lasts longer, and you can easily charge by inserting the micro USB cable on the device, without requiring any charging dock. SmartWatch 2 is water resistant. It only has vibration alert, no speaker to emit any audible noise. Feature List: Samsung has more functions. The Samsung Gear can take photos, record videos, make calls over speaker, has built-in gyroscope, which enables loads of smart interactions with the smartphone. It has pedometer to track your fitness stats, has a better screen display that is fitting in this modern age. Basically, the Samsung Gear is few steps ahead of all smartwatches in the market. It’s the gadget to get if you want to be James Bond. 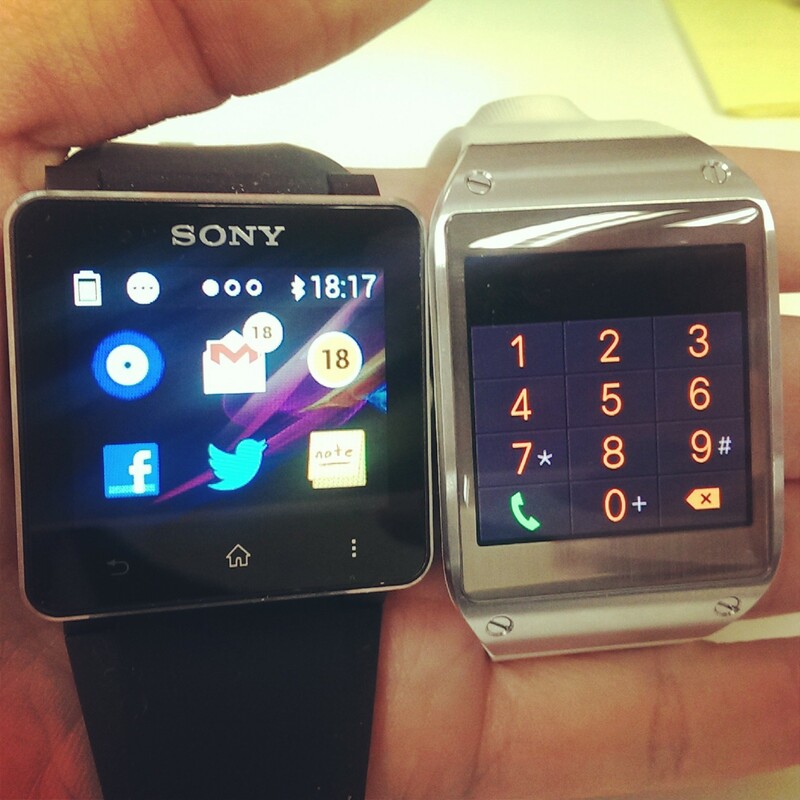 The Sony SmartWatch 2 uses similar interface as Android: with 3 fixed softkeys and a swipe-down status bar. Press the power button and you will see all the apps in 3×2 grid, with counter next to the app icon to instantly tell you if there are any missed events. The Samsung Gear has its favourites presented one icon per screen. It just takes too many swipes to find my favourite app, that I would rather search for my apps from the “Apps” menu presented in 2×2 grid, which is again fewer than Sony’s 3×2. Having more icons per screen means I can find my apps faster with fewer swipes. I also find Sony better in implementing the notification. The Samsung Gear incoming notification shows a huge app icon and minimal content summary, whereas the Sony incoming notification shows longer summary content so that I can read more. The Samsung notification is sorted by apps which I need to tap before showing me the list of notifications for the specific app. The Sony notification is sorted by time, so I can see everything within the same list. The font size on the Samsung is also larger than Sony, which ironically has lower pixels, yet I can still read notifications perfectly fine on the Sony. Smaller text means more content means I get more information from a quick glance from the Sony SmartWatch 2. Due to minimal functions., the SmartWatch 2 is less distracting to use. That is, if you want your watch to work mainly as a notification device and not more. 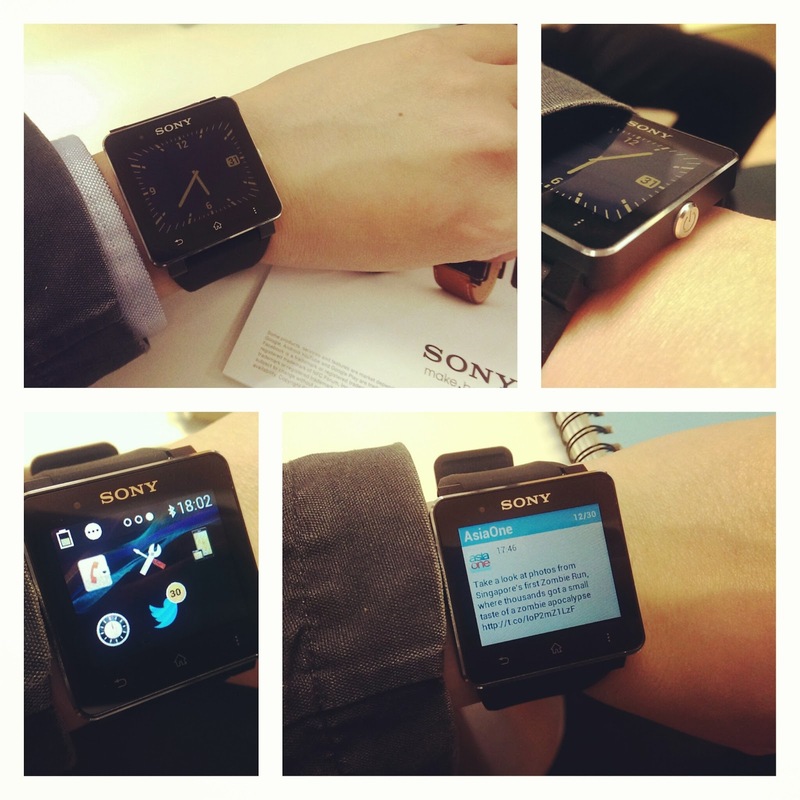 Sony SmartWatch 2 can be connected to any device running on Android version 4 and above, even on Samsung Note 3. Sony also has more apps which you can find in the Google Play Store. There may be compatibility issues for some apps, though. If you want a watch that blends with the existing urban lifestyle, with that subtle benefit of notifying you any incoming events from your phone, then Sony SmartWatch 2 gives you a good experience at a lower price. If you want a watch that is really smart and that has enough features to make you the man/woman from the future, then you will enjoy using Samsung Gear. OK, if you don’t want to use some of the outlandish functions like talking to your watch, sure the Samsung Gear can still quietly blend with your lifestyle. It’s gorgeous screen and intuitive interaction with your smartphone will make non-Samsung phone users jealous.